editing and publishing the complete draft of the first book in a new series, Grey Goose and Gander, which is set in an imaginary medieval Russia. (Yes—it’s a distance from an alternate 18th-century Pacific, but we love Russian literature, both poetry and novels, and we especially love Russian fairy tales and that outstanding illustrator, Ivan Bilibin.) More on that series in future blogs! Among the main characters in Empire is Lucien de St. Valerien, the father of Antoine, from our first book and we follow his adventures in two periods: as a senior cadet 30 years or so before Across and then as a captain, 10 years before. The latter will lead right into Across and explain various things only hinted at in that volume in the series. That we are doing so clearly shows the larky beginnings of this project as well as our desire to allow the Muse to take the story (and the storytellers) where she will. In our case, however, we are using our research as a substitute Muse. And what particularly strikes us at the moment is the interesting clash of world views of early geographers on the subject of Terra Australis. As we’ve mentioned before, Terra Australis, as a concept, dates back at least to Aristotle in the 4th century BC and the concept of the need for a balance of continents. If there’s a big one on the north side of the earth (call it Terra Borealis), it would be necessary, for the equilibrium of the earth to have a second one on the south side (Terra Australis). In our research, however, we’ve also happened upon a second view. This was popularized by a 5th-century AD scholar named Macrobius, who wrote a commentary on the last-century BC Roman author, Cicero’s, “Dream of Scipio”, itself the last part of Cicero’s longer philosophical work, De Re Publica. Cicero begins with the theory of more than one inhabited continent, but then shifts to describe an earth divided into five climate zones (reading from top to bottom: cold (and so uninhabitable), temperate, torrid (uninhabitable), temperate, and cold once more. 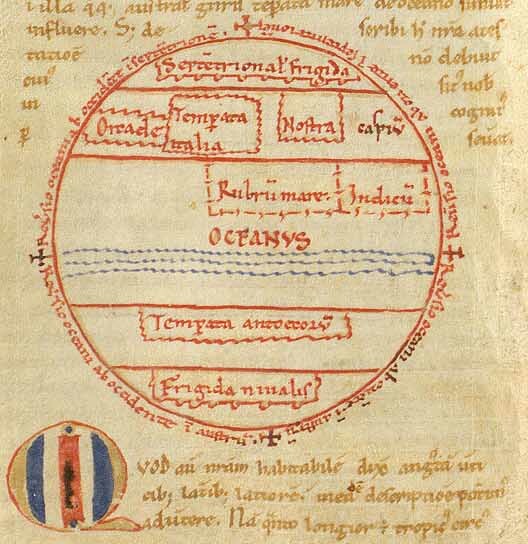 This zonal view if followed by Macrobius and a number of the maps which appear in the earliest surviving manuscripts (which date from the period before 1100 AD) shows this very clearly. with temperate regions. It then added, however, a central belt simply too hot for human existence. (Was this derived from early reports of the Sahara?). 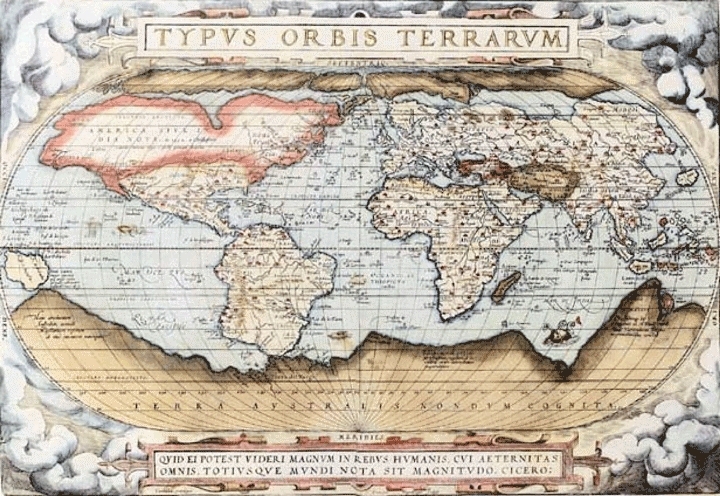 We’re still researching and creating, but our Terra Australis combines the two world views: we have a habitable southern continent, but one which is gradually falling under the control of a god—Atutlaluk—whose power is gradually turning Terra Australis into terra frigida—although it is gradually turning from incognita “unknown” to cognita “known” to us—and will be to you, in our next Across book, Empire of the Isles. 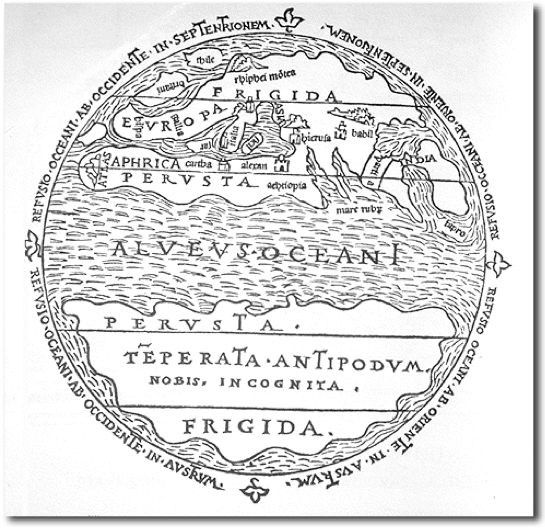 For a detailed and very interesting article on Macrobius and maps, see Alfred Hiatt, “The Map of Macrobius before 1100” available as a download at http://dx.org/10.1080/03085690701300626. As we put the finishing touches on Across the Doubtful Sea (we’ve just realized that we need to have a title on the spine for the print version—oh, and a bar code on the back–yep, the things we never thought about when we were reading someone else’s book), we’ve already begun work on the second in this series, entitled Empire of the Isles. So, where are we going in this book? Logically, you might say that we should continue in chronological order, begin the second book where the first concluded. After all, at the end of the second book of The Fellowship of the Ring, JRRT didn’t double back into earlier times to the previous defeat of Sauron in which he lost finger and ring and gradually work up to Gollum, to Bilbo, to Frodo . Elements of the past of Middle Earth, of course, appear everywhere in the text, often in geographical features like barrows, the Greenway, and Weathertop, very much the way the past was always present in JRRT’s England in barrows and stone rings and Hadrian’s Wall and castles and the ruins of monasteries. For us, this is one of the book’s great attractions and strengths . The specific past of the ring itself appears in “The Shadow of the Past” (with its resonant title, suggesting not only that the past casts a shadow upon the present, but that, involved in all, is The Shadow—Sauron) and “The Council of Elrond”, chapter 3 of the first book and chapter 2 of the second. But is that where we want to go? And, the answer is, no. Instead, we’ve decided to go into the past, but not just in flashbacks or explanations. As we wrote Across, we found it necessary to make reference to earlier events, but this was always done in bits and pieces, where needed for the present narrative. (No spoiler alert here—although this makes an interesting challenge in essay-writing for us: how can we discuss that narrative without too much specificity? How can we inform but tantalize at the same time?) Suppose, however, that we wrote a second book whose plot was based entirely upon events which had happened before Across. We knew from Across that our main male protagonist, Antoine de St. Valerien, was in the Calm Sea (our Pacific) in part in search of his father, Lucien de St. Valerien, who had disappeared there on an earlier mission. Instead of fragmentary glimpses of his father and his doings, as was the case in Across, why not make the whole next book about him? As we have written in an earlier posting, a basic premise of our trilogy is that Terra Australis, the southernmost continent which explorers and cartographers and sometimes corporations and governments once believed existed , is, in fact, real. (For those of our readers who would like to know more about this idea, we recommend: William Eisler, The Furthest Shore: Images of Terra Australis from the Middle Ages to Captain Cook, David Fausett, Writing the New World: Imaginary Voyages and Utopias of the Great Southern Land, Glyndwr Williams, The Great South Sea: English Voyages and Encounters, 1570-1750, among many other interesting works.) 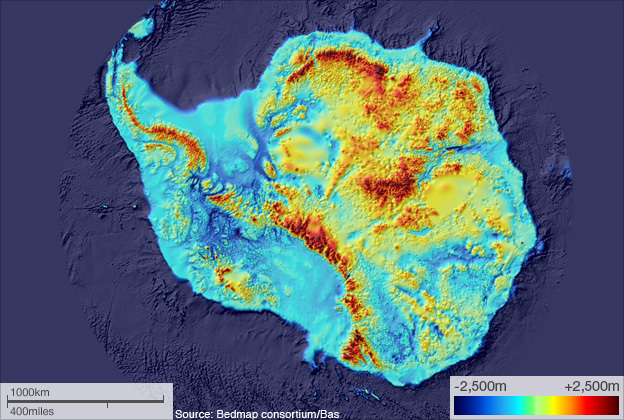 In our contemporary world, this is Antarctica, of course. In this alternative world, however, it is not an endless sheet of ice which covers a land mass of rock, but rather the place which those earlier explorers and others believed it to be, a country with a mixed climate, fertile land, and growing seasons. In our imaginary world, however, things are changing, owing to the influence of the people who live at its center, the Atuk, and to their god, Atutlaluk, whose power lies in cold and whose chief followers can mobilize the elements of winter against their enemies. Opposed to the Atuk are the Matan’a’e amavi’o, a Polynesian people who have long inhabited a string of a dozen islands to the north and who have more recently colonized the western fringe of Terra Australis. Much of this was already in place in Across, but now we could use this second novel to fill in so much more: the history of colonization, the beginnings of the war between the Matan’a’e amavi’o and the Atuk, more about the Atuk, who they are, where they come from, all as a background to the story of Lucien and the part he plays in the greater narrative of the struggle between these peoples. As we write Empire of the Isles, we’ll do what we’ve done for Across and invite you into the literary equivalent of backstage, in hopes that you’ll enjoy knowing more about where it all comes from and how it all comes about. In this post, we want to talk a little about research. We’ve already shown you bits and pieces of what the world of Terra Australis and its peoples look like to us—and we hope to you– but we want to add a bit about some of our sources. And we were aware of Captain Cook, who was also involved in that war and even must have sat across the St. Lawrence River from de Bougainville at the siege of Quebec, in 1759, although neither would have been aware of the other at the time. So what then? Lots of conversation first, based upon nothing more than our imaginations. Who would our characters be? Where would our characters go? What might happen to them? As we talked, we began to see that, now that we had a very general idea of the beginnings of a book—and, soon, a series– we needed to know more—lots more. And here was where our plan to base our new, alternative world on the actual later 18th century of the actual world quite easily supplied a great deal of useful knowledge. We embarked upon a period of research even as we began to write a draft of the first chapters. And this research quickly proved helpful in two directions. First, it began to answer our questions about the 5 categories. Second, the answers would inspire us, not only to ask further questions, but to further creativity. With that previous experience in mind, perhaps it was just as well that we decided not to write an actual historical novel, although we can certainly see that there are lots of possibilities there (we might cite our ancestor-collaborators, Nordhoff/Hall, and their series on the Bounty mutiny and its consequences, for an example). By making this an alternative world, we could use whatever we liked from our world, but never feel quite so bound as one might in a work of historical fiction. In our own reading, we very much enjoy learning about earlier authors and how they wrote their books. And so, in these posts, we want to provide you, our readers, with information which, before you read our first book, we hope will entice you to do so and, after you’ve read it, will help you to see something of how we wrote it. We intend, after Across the Doubtful Sea appears, to include a complete bibliography—including a list of websites and their addresses we found useful or just too interesting not to read (and everyone who surfs the web knows the dangers of this)—in our blog, but, for now, here are a few books we found particularly stimulating/useful. As we said in an earlier post, we experienced some difficulty in our research, owing to the period in which we were working, the 1750s to about 1790. There was plenty of material for the Revolutionary and Napoleonic Wars, 1793-1815, but much less easily available for this earlier time. Our advantage in alternative writing, however, stood us in good stead here: we didn’t feel that we had to be accurate down to the last fact, and we could use what we learned from this slightly later time to flesh out what we could discover of the earlier time. So, for example, the Osprey books on Napoleonic naval wars—books like Terry Crowdy’s French Warship Crews 1789-1805, or Gregory Fremont-Barnes’ Nelson’s Officers and Midshipmen and Nelson’s Sailors, or Chris Henry’s Napoleonic Naval Armaments 1792-1815–proved very helpful in getting a general sense of life on board the warships of that world. We would add, from a Time/Life series, Henry Gruppe’s The Frigates, as well as books like Iain Dickie et al., Fighting Techniques of Naval Warfare 1190BC to the Present, Nicholas Blake and Richard Lawrence’s The Illustrated Companion to Nelson’s Navy, and Brian Lavery’s Nelson’s Navy. As for Pacific exploration, an easy read is Alistair MacLean’s Captain Cook (with Peter Beaglehole’s more scholarly work for those who want to learn more). For two different views of its consequences for the native cultures and peoples , we would recommend Alan Moorehead’s The Fatal Impact: The Invasion of the South Pacific 1767-1840 and Bernard Smith’s European Vision and the South Pacific. For a more general view, we would add the relevant portions of Erik Newby’s The Rand McNally World Atlas of Exploration. This has been a long entry, and we never intend to overwhelm our readers, so we’ll end here for the present, with promise of more, both on books and on websites, in our next. In our last, we continued discussion of our heroes. So far, we’ve talked about the French and the English, their look and their ships. Now we want to say something briefly about our heroes—mostly, in fact, heroines—from the Calm Sea (in our world, the Pacific). As we began to model our villains, as we’ve said, we combined the look of the Inuit with that of Persians and Ottoman Turks. This gave us both a wintery exterior and a lush, brightly-colored interior. 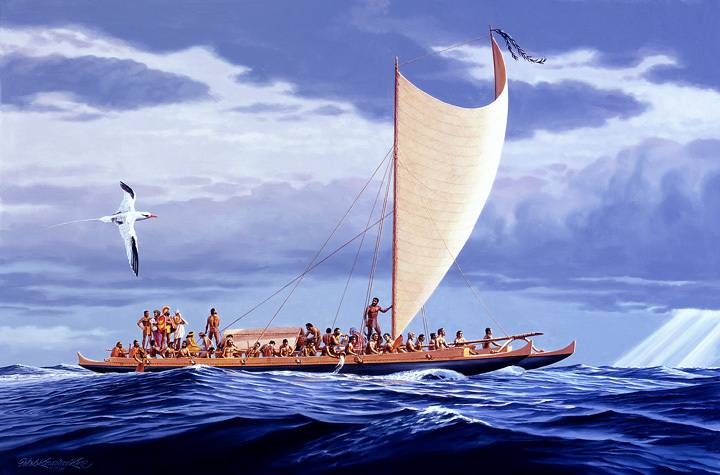 For our Calm Sea heroes, we’ve looked to the Polynesian adventurers who colonized the eastern and southern islands of the Pacific between 800 and 1300AD. 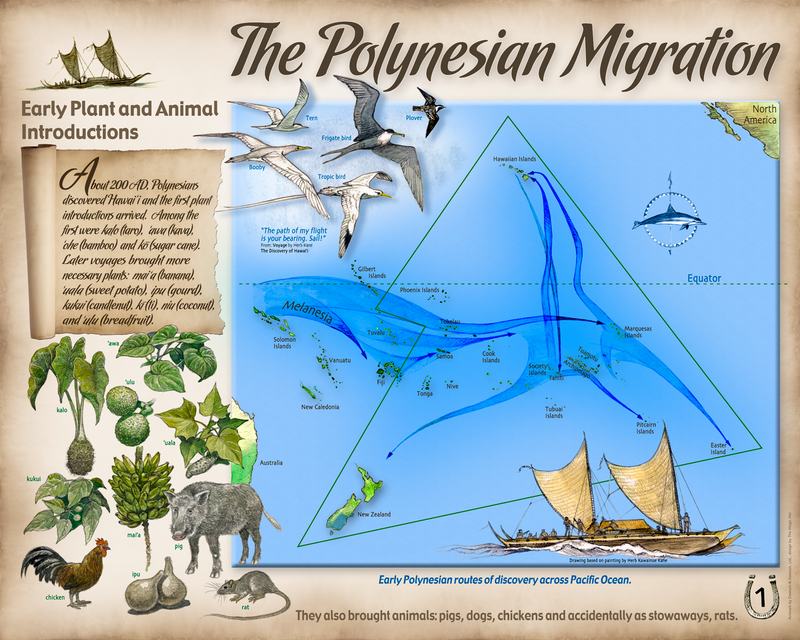 To narrow this a bit, we borrowed linguistically mainly from the Tahitians, but visually from a wide variety of peoples, with perhaps more visuals chosen from the Maori than others. We call our people the Matan’a’e amavi’o, “the people of the goddess Matan’a’e”. 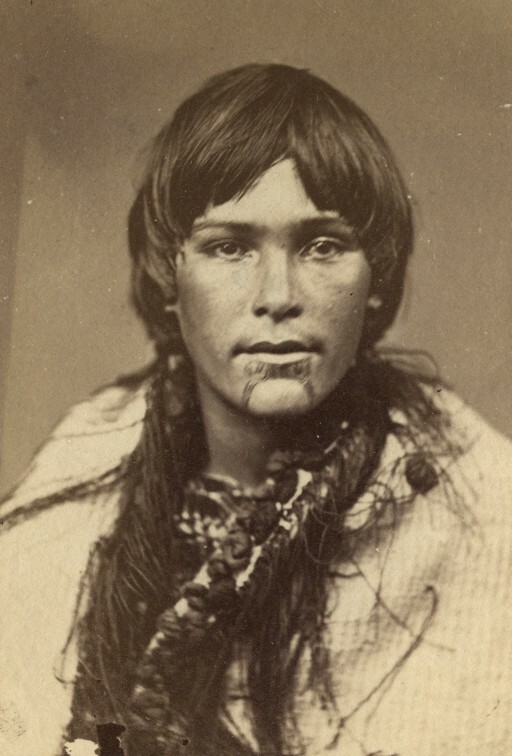 For example, our heroines, Matan’o’ahei, the warrior priestess of the goddess Matan’a’e, and her younger sister, Naru, both wear a distinctive Maori tattoo, or moko, on their lower faces as a mark of their status as belonging to a priestly family. 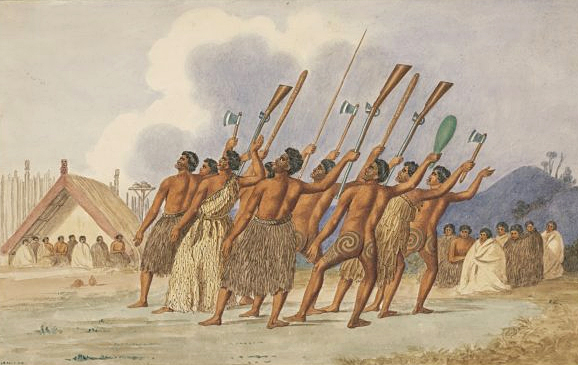 The warriors of the Matan’a’e amavi’o we imagined as looking like Maori warriors—here doing a traditional war dance, a haka, in this early 19th-century illustration. 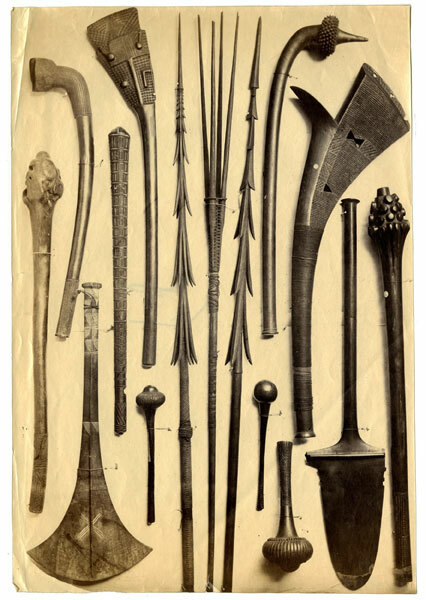 Here’s a selection of Maori weapons—the weapons of the Matan’a’e amavi’o, as well. 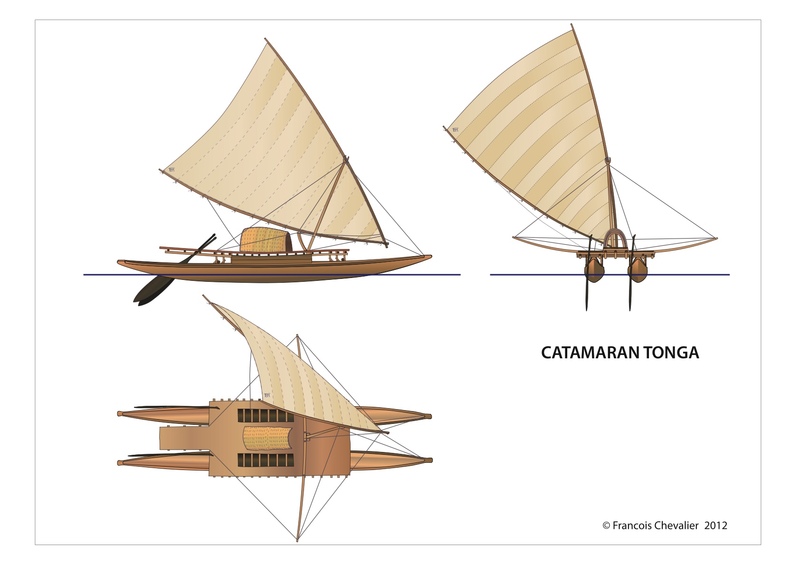 For their ships, we have created a sort of Polynesian-based warship, our model being the catamaran. 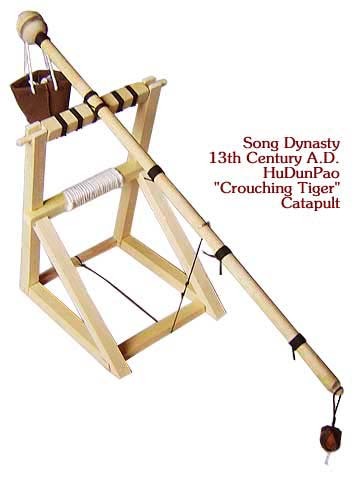 To give such a ship some teeth, we added this, a small, very basic catapult, of the sort seen in early China. 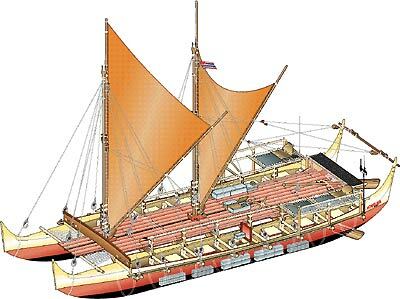 As for their opponents, whom the Matan’a’e amavi’o call the Atuk amavi’o, “the people of cold”, we will discuss their ships in our next post. If you have any questions about any of our past posts, or about the civilizations we are developing in our novels, please let us know.